Still trying to find a good location to mount my speakers. Keri said she mounted hers under the seats or just suggested it? Is that correct? I currently have some 4" speakers mounted in some old surface mount enclosures but I hate their location. And the enclosers are not made for these type of speakers with tweeters mounted in the centers (notice the budge). I've considered mounted them in the doors. Getting the wires to the radio maybe a challange. I'll have to drill a hole through the sides of the door then possible run the wires behind the weathertripping that way. Otherwise remove the front fenders so I can feed the wires in through the door, through the door jam and into the cabin that way? Mount them in the package tray. Trouble with this location is this Panasonic doesn't push a lot of watts. I'd rather have them up front so I can hear them better. Or mount 4 speakers in both locations. I'd rather not cut any holes in the existing package tray or door panels but rather fabricate my own out of vinyl and fiberboard. You know just in case. The other idea was to fabricate some 4" speaker boxes and cover them in felt material which I just so happen to have and just lay them on the original package tray and apply a little 3M adhesive to keep them from sliding around. Or just install the original radio blanking plate, remove the sound system altogether and carry around my Ghetto blaster/Brixton briefcase in the backseat like people used to do back in the 1980s. Anyone that has ever owned one of these knows they eat D size batteries! My vote is for the blanking plate and ghetto blaster. You can also mount speakers under the seats. Mine still has two speakers attached under the rear seat. They make "hide-able" speakers, although in a Trabi kind of hard to really hide. Perhaps you could create a backing plate to what you have and get some strong double sided adhesive tape and mount them to the kick panels on either side. I don't know how I feel about drilling into the doors, plus you could run into a depth issue or mounting issue which would require more modification. That way I can aim the speakers towards the front. I just got to make sure I have about 4" of clearance between the seats and floorboards first. I think that is a pretty good idea. I know that the old Ford trucks used to do floor mounted speakers behind the seats and they worked well. So I like your idea and think it would work. First, I need to say that my Trabi is 1989, and I drive it for fun on nice sundays -I do not consider it really a vintage vehicle. I am not strictly concerned about original period accessories at all times. I like to put on some enhancements, but with some respect to the vehicles history. I am not giving up modern technologies though. This is how it looks like - nothing agressive, decent white illumination with a blue ring around the volume knob. Then I figured that the original cardboard behind the rear seats is kind of weak to hold these 6x9 inch speakers, so I created a new one out of some plywood and spreaded on an imitation leather that somewhat matches the color of the interior. frogbros and Justin like this. I was considering mounting my door speakers this weekend, I was going to do the bottom right but you bring up a good point in regards to hitting them with your foot. I may do bottom left myself too! Looks good! 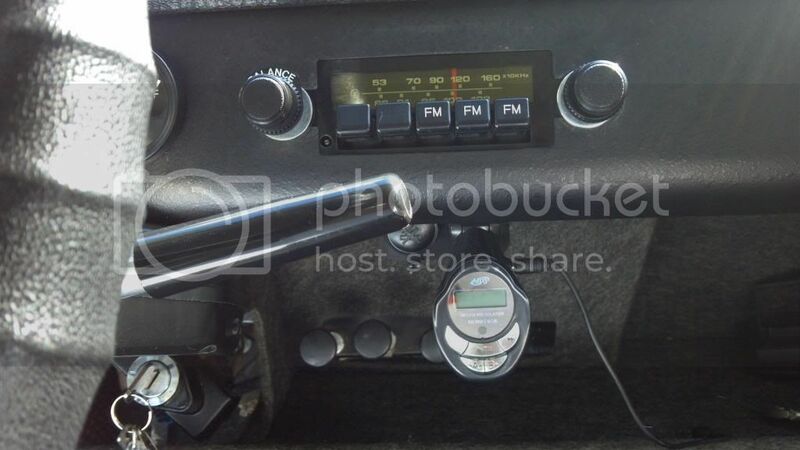 I'm still debating on wheather I want to mutilate my dashboard for DIN radio. I was told a DIN radio would fit the hole on the passenger side but I tried one and it still looks like some hacking would be required. I considering fabricating a package tray myself and poking holes through the vinyl covering with an awl and mounting the speakers underneath instead off on top. Or I could just try and find some thin vinyl and maybe the sound will penetrate it without muffling the sound too bad. Actually the door speakers would probably get the job done. I want to keep the car looking "period correct" but I like listening to my tunes! I considered just carrying a ghetto blaster in the back seat like people used to do back in the 1980s with factory AM radios in their cars. Thanks that will be my next project after the break system. Turbofiat 124 could you not rig up some kind of converter from the Trabi 12v supply to the ghetto blaster? I'm sure I could. I have a 12V power point I installed under the radio for my USB cell phone charger and MP3 player. I later discovered both of which will work off the factory 6V Hella power point under the dash. I guess because they both are reduced down to 5 volts. Some ghetto blasters already have a 12V input. I had a Lasonic ghetto blaster as a teenager (back in the big 80s!!) like this. It had a short wave band, four speakers , you name it. When the cassette player went out on it, I robbed the power supply so I could build digital circuits on bread boards at the house to get caught up on projects for school. Then one day I decided to put the radio back in service so I just took an old 12V AC to DC adapter, cut the end off it and drilled a hole in the back of the radio and wired it directly to the red and black wires that connects to the springs that held the batteries in place. That thing ran for 24/7 for 15 years on the back of my parents porch. All the chrome knobs had turned green from the humidity exposure. It didn't get rained on but was not in an ideal location. Eventually after almost 30 years of continuous use it bit the dust and I chunked it. I still have a couple of other ghetto blasters out in my garage. I miss the 1980s! Check out this modern Lasonic ghetto blaster with IPOD and USB/SD card unputs! Sorry to bump such an old thread - but I'm interested in how well those Pyle head units work - they're only 25 quid on eBay, so I'm very tempted. I'd want an AUX ideally - but I can use my Bose bluetooth speaker for that. I want a retro looking head unit that also has some modern functions - a Lidl unit just wouldn't suffice... and I have several late 80s / early 90s digital units in my garage. How did you run your speaker wires for the doors? I looks like in order to get the wiring to the door three holes would have to be drilled. One in the door, the door jam and one under the dash. Well for both speakers.